Stating that an altercation involving Dallas Cowboys cornerback Pacman Jones was a continuation of “a disturbing pattern of behavior and clearly inconsistent with the conditions I set for your continued participation in the NFL” Roger Goodell has suspended Jones for at least four weeks. Jones was reinstated just six weeks ago following a 17-month suspension for troubles when he was a member of the Tennessee Titans. Cowboys owner Jerry Jones refused to take action on the incident proving the theory that the only people who will be upset by this move are the ones who have something on the line when it comes to Pacman. Jones represents a lifestyle that many try to emulate by living with no boundaries or accountability. 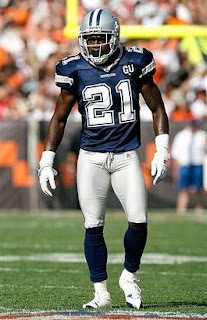 He represents hope for a depleted Dallas secondary. For those reasons some fans will be up in arms over the decision to suspend him. Jones also represents everything that is wrong with third, fourth and fifth chances and he may have run out of his nine NFL lives. Commissioner Goodell will determine Pacman’s fate after the Cowboys play at Washington on November 16th. If you want to get mad about this try getting mad a Jerry Jones for signing a guy who had a proven track record of being a thug above all else. No one in the Dallas organization should claim to be surprised by this because it is what Jones has been doing since his college days. How about this, why not get mad at Pacman? He’s the one who has shown to be selfish and has put himself above the team by going out drinking and fighting.